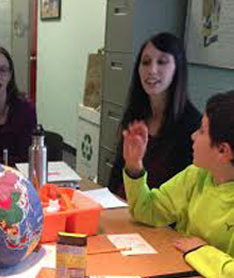 Sarah Lavezzo, this week’s Educator of the Week, is an enrichment teacher for grades 1-5 at an elementary school in Washington, D.C. She previously taught fifth grade. This is her second year using the U.S. Institute of Peace’s Peacebuilding Toolkit with her students. While teaching fifth grade, I attended a training at the U.S. Institute of Peace. I learned about the Peacebuilding Toolkit, which I was eager to use! While designed for middle school, I easily adapted the toolkit for my elementary classroom and integrated world history, world cultures, and language arts content. My students and I began the unit by defining peace and conflict. We then worked on identifying and dealing with conflict, and finished the unit with ways to put this new knowledge into action. The program has great hands-on activities that my students loved, which led to more student-driven activities to supplement the content. One of my favorite activities in the Toolkit is “Cross the Line”; it’s a partner role-play that involves acting out a conflict. The partners are separated by a line. They each secretly receive the same instructions: They will spend their life in prison if they do not convince the other person to cross over to their side and remain there until three minutes is up. Another student observes the partners during the activity. At the end, we debrief and talk about who was “saved” from life in prison. Most of the time there are one or two groups that figure out the secret: They need to share what was on their instruction sheet with their opponent! The follow-up discussion for this activity is always so interesting. It focuses on the importance of open communication and cooperation. This highlights my favorite part of the Peacebuilding Toolkit—the activities are engaging and spark fantastic student-led follow-up discussions. How did this activity impact your students? When I added this program to my classroom I noticed a huge change in how the students interacted with each other. About halfway through the school year, I realized I rarely had discipline problems. Every day I would overhear my students sharing words of encouragement, such as “I like what you’re thinking. Can you share more?” They were great at getting their peers to feel safe enough to open up in class, which made for a more vibrant classroom. I definitely noticed a sense of empowerment grow within my students as the sessions progressed. When the group first started, many were shy and unsure that they could actually make a difference. As we dug deeper into conflict and real-world situations (like the controversy surrounding new D.C. school boundaries), they began to see that peace is achievable and they can make a difference right now as children. How does teaching with a global perspective impact your students? The students see their world in a new light because they learn to understand and accept differences. They empathize with hardships and celebrate the victories of their peers. A global perspective teaches kids that they have a critical role in the direction of our world, and it starts with how they live every day. They understand that each day they have the opportunity to do something great and to inspire others. My school participates in the Embassy Adoption Program, which is sponsored by D.C. Public Schools and the Washington Performing Arts Society. Classes benefit from visits from their partner embassy, performances by world-renowned musicians from their country of study, resources like artifacts, books, and samples of clothing, and more. 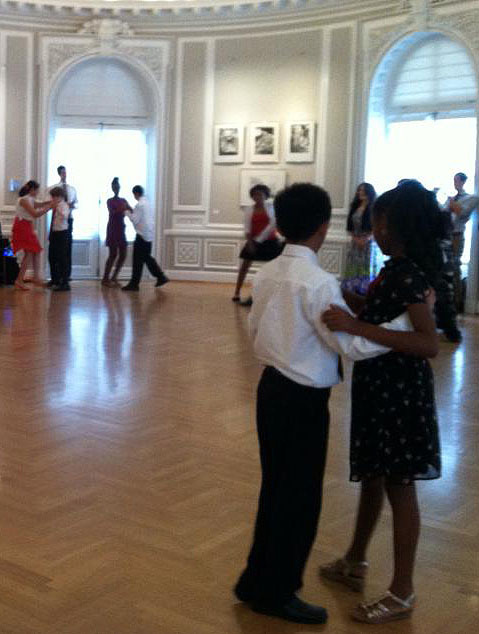 Last year my class was taught the Argentine tango by the amazing musicians and dancers of QuinTango. They came for five sessions, teaching not only the dance but also about the culture and history of our partner country. The first day the kids were so nervous about having to dance with someone, but by the end they looked fabulous and confident! One of my proudest moments as a teacher was seeing them glide in the ballroom of the embassy during their final presentation, decked out in suits, dresses, and smiles. They learned about another culture, yes, but they also learned the importance of camaraderie, diligence, and confidence. This is what global education is about—helping young people develop a global awareness while also developing their character so they can make an impact on their world. What advice do you have for teachers who want to get more involved with teaching students about the world across disciplines? Capitalize on their natural curiosity by allowing students to explore our world and its people through books, videos, special guests, pen pals, and more. Kids naturally want to learn about global issues, so give them the opportunity to take control of their learning. If you find that your class is interested in a particular culture or historical topic, use that as a catapult for teaching across the disciplines. Most importantly, as an educator, don’t be afraid to reach out for help. The most effective global education lessons/units in my classes were not solely my ideas—they came from collaboration with coworkers, organizations, students, or parents. I’m so grateful for the many people who continue to help me and lend their expertise and experience! Many people are eager to help mold students’ minds in a global way. Do you have a favorite quote that inspires you in your personal life or in your teaching? Previous Previous post: Where There’s Smoke, There’s . . . Tornadoes? Next Next post: ‘Bigfoot’ Spotted in Yellowstone?